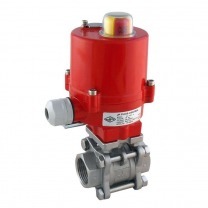 Electrically actuated stainless steel ball valves are used for a wide variety of aggressive, corrosive media. The material is highly wear-resistant and the valves are often resistant to high temperatures and operating pressures. The most common types are 304 and 316, of which 316 steel has the best corrosion resistance. For some media, such as chloride solutions, stainless steel is (mostly 304) not recommended and PVC can be used instead.